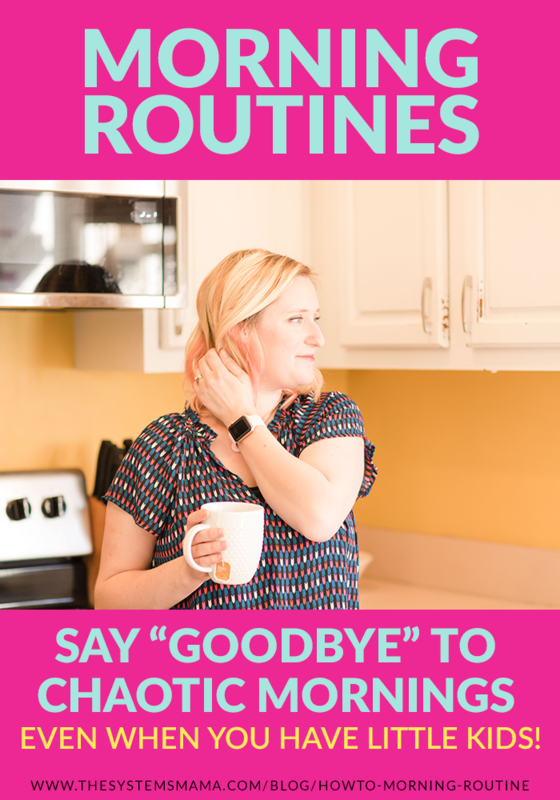 Routines are such a lifesaver for me and they’ve taken our always-running-late and chaotic days to usually on-time and mostly smooth (I mean, three kids ages four and under is going to be naturally chaotic). Morning routines have always been my favorite, I used to wake up two hours early in elementary school and I had an extremely detailed, down to the minute, morning routine created for myself. I have a distinct memory of sitting down at the family desktop computer and typing up a routine in Microsoft Word that was so detailed that it even included what time, while I was in the shower, that I should shampoo my hair. True story. Since having kids my morning routine has been even more important to help me stay ahead of the day. But I have also learned that when you have a baby, the first year of their life, you need to show yourself a lot of grace and be okay with missing the normal morning routine. ‘Cause mama needs as much sleep as she can get! So until your child is sleeping (mostly) through the night, be as lenient as you can be with your morning routine so that you can get as much sleep as possible. Once baby is on a good wake/eat/sleep schedule, it will really help you nail down your daily routines and your morning routine. Like daily routines, your morning routine will change fairly often, depending on the season you are in. No matter what season it is, I always recommend that if possible, you should wake up before your kids and get ready for the day before they are awake. I know that some kids have natural alarm clocks that are ridiculously early so you need to do what works for your family. I find that when moms can wake up before the kids and get themselves ready for the day, they are more mentally and emotionally prepared for when the kids do wake up, giving them more patience and excitement for the kids. Creating a morning routine only takes a few steps. Answer these questions to create your morning routine. 1 - What HAS to be done in the morning? 2 - What time do you need to be out the door in the morning? Or, if you do not have anywhere to be, what time do you want to ‘start’ your day? 3 - How long does breakfast time usually take? If you aren’t sure, you can totally time it some morning. 4 - How long does it take you to get ready in the morning? 5 - How long does it take to get the kids ready in the morning? Add up all that time and subtract that amount of time from the time that you need to leave the house by. So if you need to be out the door by 8:00 am and it takes 2 hours for all of your morning routine necessities, then you need to wake up at 6:00 am to be ready in time. It’s always better to give yourself some extra time so you aren’t feeling rushed and chaotic as you try to get out the door. If you feel like you can’t wake up as early as the math says you need to, see where you can try to save some time. If you can’t find anywhere to shave some time off, then slowly condition yourself to wake up that early. Every day, set your alarm a little bit earlier until you get to that early start time and if you are still oversleeping, do what I do and set an alarm for BEFORE your wake up time. This will help your body start to wake up so that by the time you have to wake up, your body is a little more ready. Need an example of a morning routine? Here is my morning routine GOAL. It does NOT always happen. It really depends on how well the baby sleeps overnight. If she sleeps well, then it is more likely to happen. When we are able to stick to this ideal morning routine, our morning flows at a good speed, not too fast and not too slow. One of the things that helps me to stay on time in the morning is to set alarms. I have alarms set every time we need to move on to the next part of our morning routine. I actually saw Jordan Page do this in one of her videos and totally stole it for my routines. What do your mornings look like, share a photo and tag me on Instagram and use #myhomemakingsystems and/or #iamajoyfulhomemaker so we can all see it! Or better yet, share some videos of it in action on Instagram Stories!